Joesph ben Solomon of Carcassonne was a French liturgical poet of the eleventh century. He wrote a Ḥanukkah yotser beginning "Odeka ki anafta," which is mentioned by Rashi in his commentary on Ezekiel 21:18. Joseph took the material for this yotser from various haggadot, working it over in a payyeṭanic style. It is composed of verses of three lines each, arranged in alphabetical order. 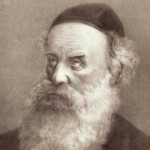 Rabbi Shneur Zalman of Liady (Hebrew: שניאור זלמן מליאדי‎) (September 4, 1745 – December 15, 1812 O.S. / 18 Elul 5505 - 24 Tevet 5573), was the founder and first Rebbe of the Ḥassidic movement known as ḤaBaD, then based in Liadi, within Imperial Russia. He was the author of many works, and is best known for Shulḥan Arukh HaRav, the Tanya, and his Siddur Torah Or.